The 2.5t Modified tractor called ,,Silberfuchs´´ was sold. 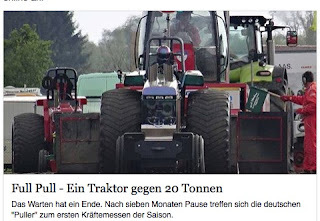 Ulrich Kropp from Nottuln, in Germany sold the tractor without the Chevy V8 engines to a new Team from Schleswig Holstein, in Germany. Who the new owner is, isn´t known at the moment. The German Tractor Pulling Association has a place at the Agritechnica 2015 in Hannover, Germany. 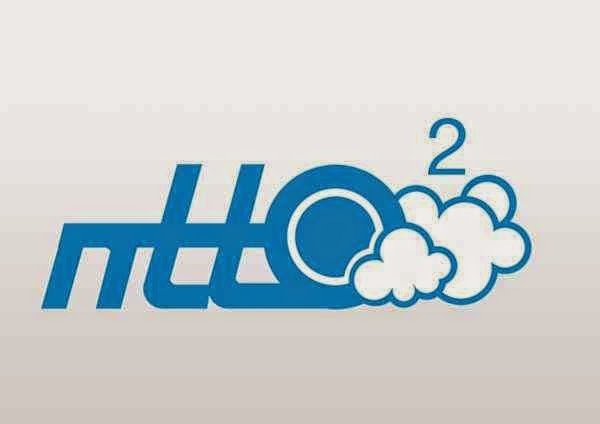 The DTTO has their place in ,,Halle 13´´ Section ,,A42´´ this year. The Agritechnica is the world´s largest exhibition for agricultural machinery and is organised by the DLG. 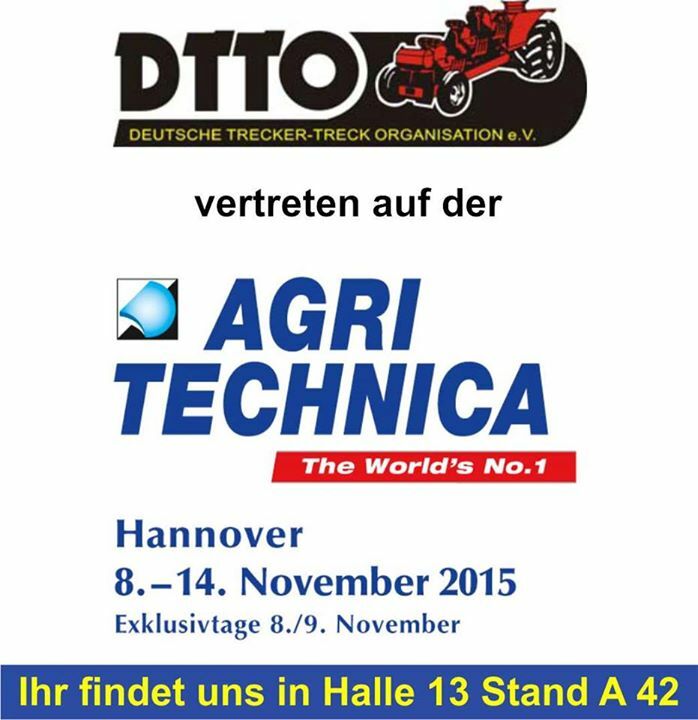 The Agritechnica is from the 8th of November to the 14th of November 2015. 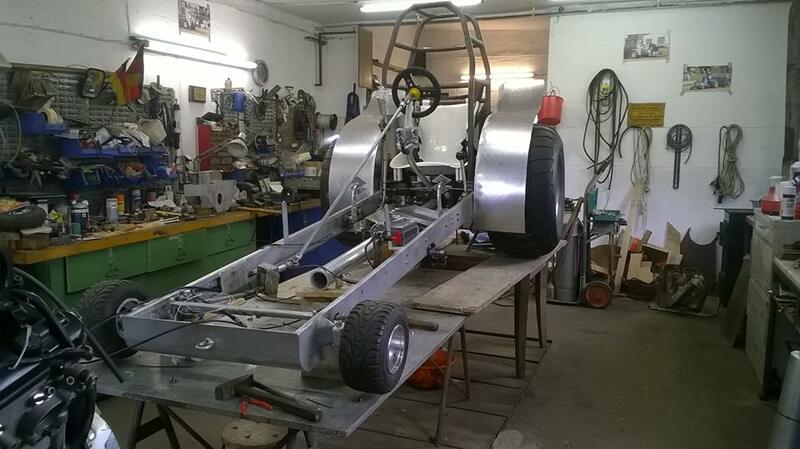 After a lot of work during the last months, the new Modified 600 kg tractor called ,,License to Kill´´ of Jan Oeltjenbruns from Habern Zwei, in Germany is ready. The Modified tractor is powered by 2 Suzuki Hayabusa motorcycle engines on petrol fuel. 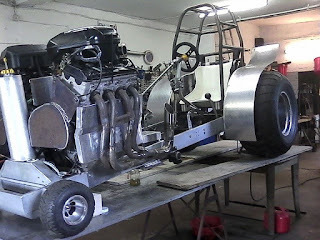 The both engines sit side by side on the tractor. 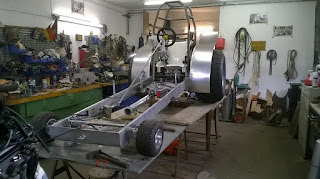 The tractor got a homemade wedge frame with a homemade ROP, a homemade gearbox and a homemade Crossbox. The fenders were made from Aluminium. Jan use on the tractor a set used Trelleborg tyres with light steel rims. 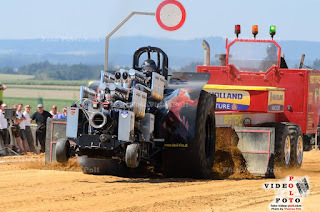 The Kaiser Pulling Team from Gussenstadt in Germany, has now a new website ! 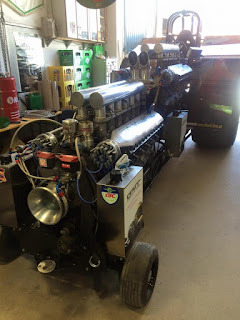 The IH 3.6t Farm Stock tractor called ,,Wild Thing´´ of Stefan Kronvall from Sweden was sold to South Germany. The new owner in Germany, isn´t known at the moment. The US Guestpullers for the 38th European Superpull (5th of March 2016) in Ahoy, Rotterdam (NL) are known. 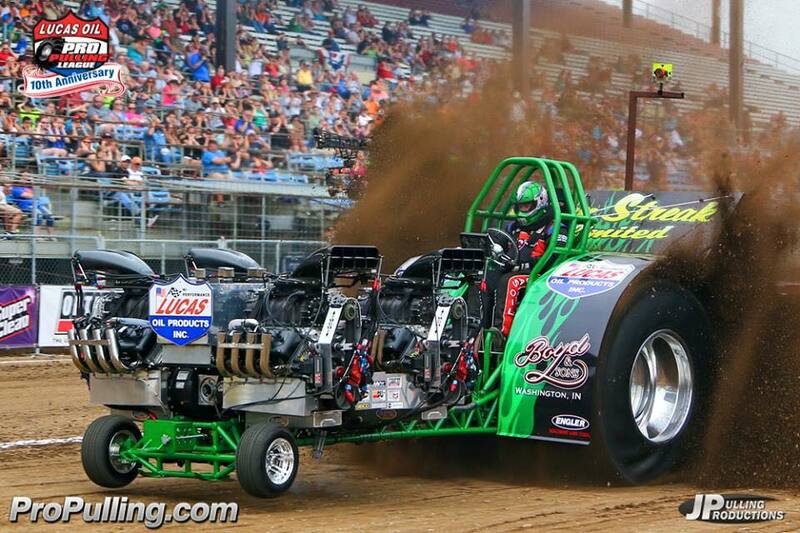 Greg and Steve Boyd from Washington, Indiana (USA) will bring their both Unlimited Modified tractors called ,,Lucas Oil Green Streak´´ & Green Streak Unlimited´´ to Rotterdam next year. Both Mod tractors are powered by 4 respectively 5 blown V8 Miner bros. Hemi engines and are well for over 12500 HP. When the Team come to Ahoy, one of those tractors will have 5 new Sassy Racing V8 Hemi engines with over 12500 HP. 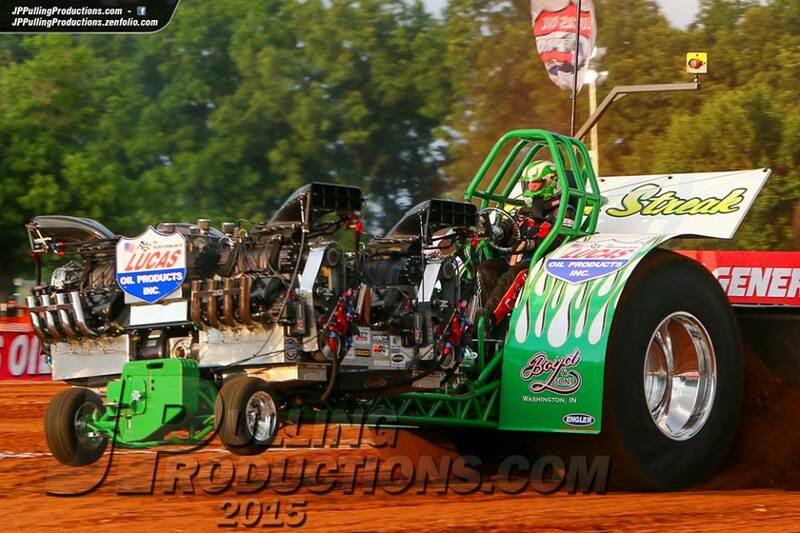 But, which of those both tractors will have the 5 Sassy Racing engines, isn´t sure at the moment. 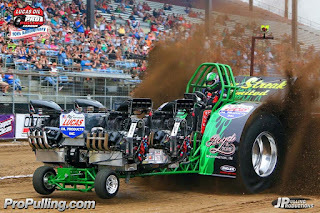 Normely, the Green Streak Pulling Team compete with both tractors in the PPL E3 Sparkplugs Super Modified class with 4 V8 Miner Bros. engines in the USA. Congratulations to all Dutch Champions 2015 ! 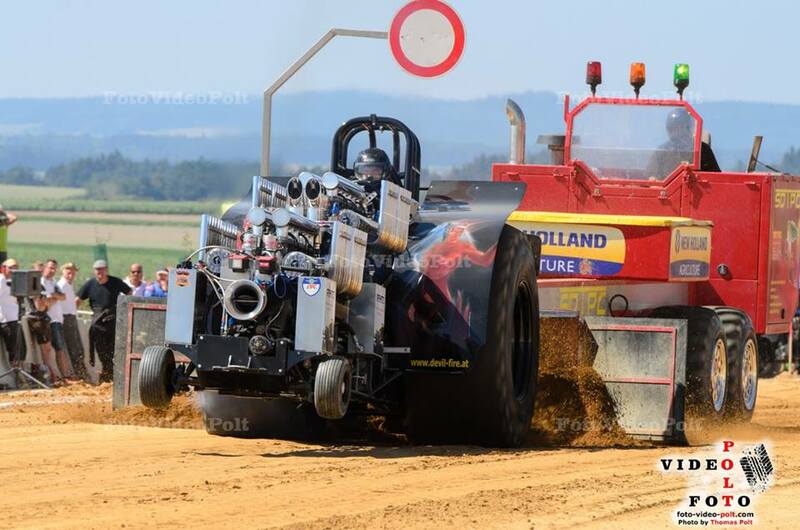 The stair step Allison V12 powered Modified tractor called ,,Black Devil´´ from Hagenberg, in Austria got some changes during the last winter. 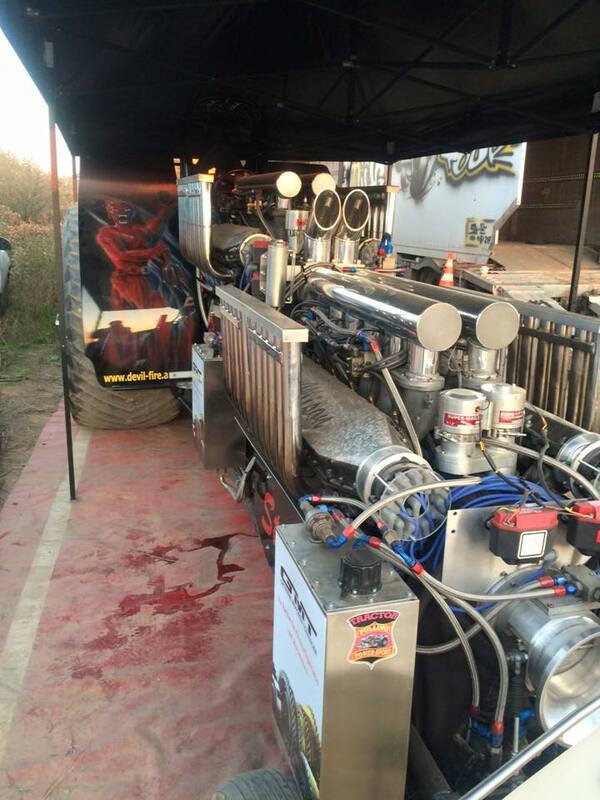 The Austrian Team made the switch from petrol to methanol fuel, this year. 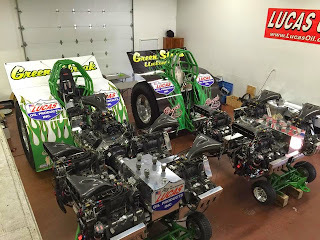 Each Allison engine got a intake manifold, a Hillborn injection pump, a new air intake funnel and a Mallory igniton. The intake manifolds, the air intake funnel of the front engine, the injection pumps and the ignitions comes from the old dutch triple Allison tractor called ,,Popeye´´. The Austrian Team got also some advices and know - how from the Green Monster Team in Füchtorf, Germany. 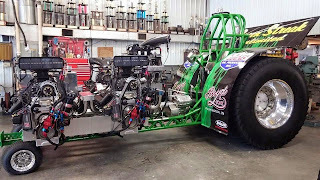 The Gusenpower Pulling Team hopes to get more horsepower from their Allison V12 engines with those changes. If you have trouble viewing it, try the hola.org app for your browser with a German IP.